Coins are a great addition to heritage albums and allow the scrapper to build the family tree in a unique way. 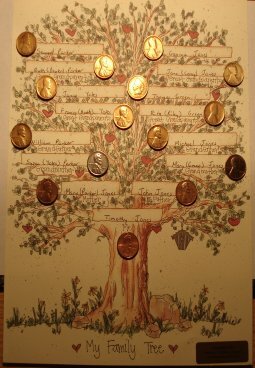 Below is a family Bonnie and I created out of one cent coins. 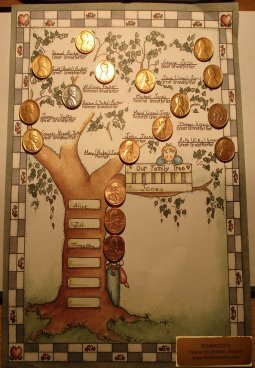 As you can see they provide a great way to show family history in a fun and different type of page. If this interests you, or you need more information about how to obtain your coins drop us a note. 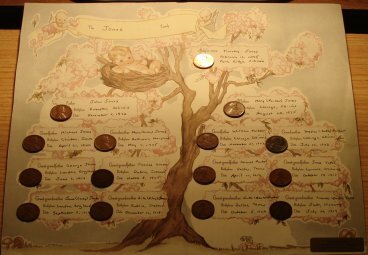 The pages pictured below are done in both polished and unpolished coins. The polished coins require an additional fee for the labor. Either way, they are both beautiful and fun to work with. All coins corne with fasteners to easily attach to your family tree, which are included in the price. Just e-mail your list and we will send you a quote. Remember our motto, We are only a click away!